Smalltown Design is excited to welcome new client - Don’t Waste The Crumbs. Tiffany, and DWTC, is in the real-food, natural and non-toxic living niche. They have quite a large following on social media including a reach of over 5 million on Pinterest alone! Smalltown Design is working to update their social media strategies, maintain and grow their audience and increase traffic to their website and membership offerings. Sometimes it is the location that is exceptional…sometimes it’s the service and staff. Every once in a great while, it is both. The event venue, A Creekside Affair, with owners Israelle and Keith, are that exceptional solution for weddings, reunions, etc.. 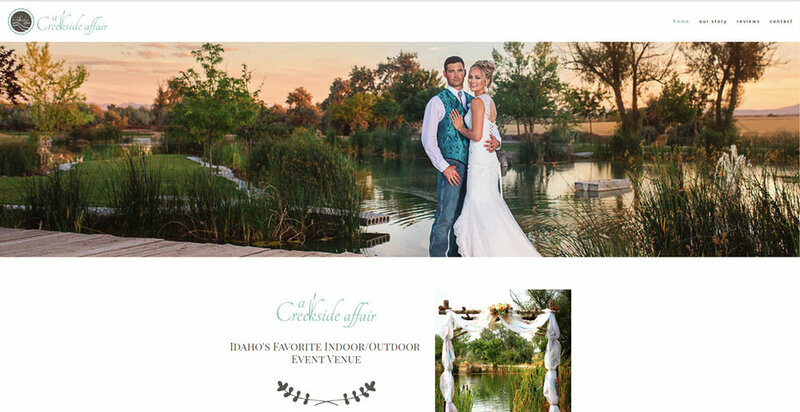 Located in southern Idaho (west of Boise), A Creekside Affair is worth exploring! Website and logos by Smalltown Design. Colleen Kolobow combines a commitment to assisting local businesses and individuals, with an extensive background in finance. From balancing daily cash flow to working for a family that owned a Major League Baseball team, Long Bridge Bookkeeping can help you find the time to live your life! Logo and brand by Smalltown Design, LLC. The City of Bonners Ferry was looking for a simplified, responsive, resident friendly website. Smalltown Design was honored to bring this project to life! Long Time Inspiration...Now a New International Client! Smalltown Design, LLC. has added a new client! We're excited to be partnering with Traditional Cooking School. This new, ongoing relationship, includes managing TCS's social media presence, applying growth strategies to those platforms, and creating unique video content for their website and social platforms (Tasty Style Recipe Videos). With a combined social following of over 250K, Traditional Cooking School has been an established online presence for over 9 years. Smalltown Design is excited to begin managing this online audience while working to grow the community and to boast engagement among the followers. This may seem new to the usual graphic/web design projects that Smalltown has become known for, however, over the past year, we have added Content Creation, Curation, and Management to our list of services. Kelsey has been training on social media strategies through courses from Food Blogger Pro, Moolah and Blog Clarity. Because the social world is ever changing, it’s important to us that we stay trained on current trends and best practices. This ensures we know the best strategies for optimizing these social platforms to build community, engagement and achieve growth. TCS has been a huge resource to our personal traditional living journey and where we’ve gleaned much inspiration for our family. So this ongoing work with TCS is truly special for Smalltown design and the Steffens! More information about Smalltown Design's Content Creation, Curation and Management? To paraphrase a celebrated architect "Environment and Design should live together each the happier for the other." (FLW). Harvest Moon Honey was looking for a re-branding where the design lived together with their environment, the Kootenai River Valley near Copeland, Idaho. Working with the family, Smalltown Design produced a logo package that reflected their environment and product. When developing a brand concept, sometimes the greatest skill is simple recognition. When working with good people, solid companies, quality products, observation can provide all the inspiration required. The trick is to not complicate it. 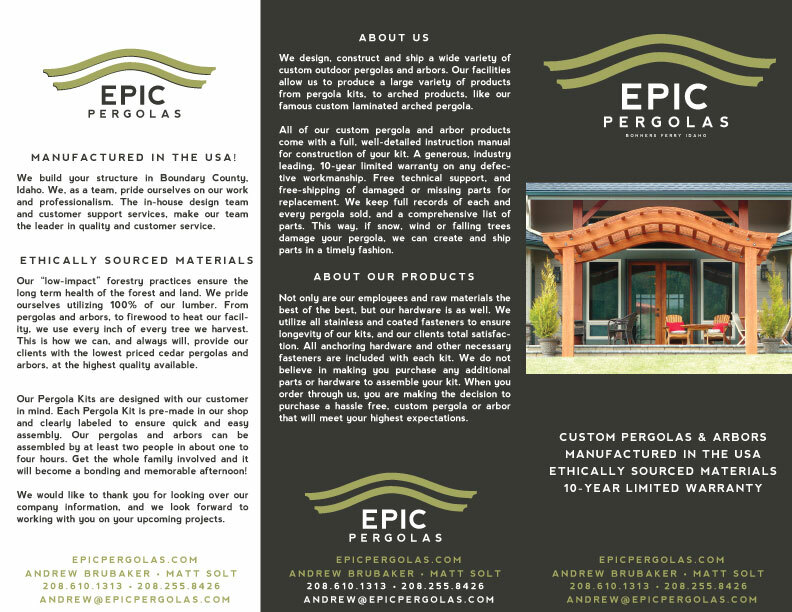 One look at Epic Pergolas signature arched structure designs and the brand concept was clear - clean & stylish lines, structural strength coming together overhead. Deborah Youngwirth, CPA, is growing! Deborah, and a talented group of associates, welcomes Crista Davis to their team...and needed a new logo to match! Creating a the new look with Deborah and Crista was a fun project...yes, I associated "fun" with "Accountants"! You can tell these folks love what they do...and are very good at it. Just read the client reviews for Mike Cox Computers...tells you all that you need to know. Mike Cox Computers is your solution for business and personal technical support. Everything from working on your personal Smart Phone to installing server based networks for your business. Mike specializes in remote support so he can help you wherever you are! By the way....Mike Cox is a great client as well. 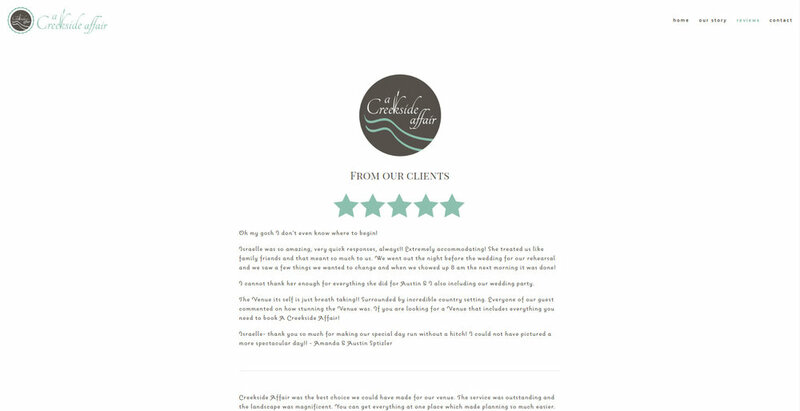 Developing this website for him was truly a pleasure! Recently launched the site redesign for Forked Tree Ranch. Does the name ring a bell? Maybe this is why. These are great people with a really interesting product. Smalltown Design has recently partnered with a client that is near and dear to us...us! In 2013 my wife, Kelsey, and I began to discuss a project that would bring together our collective abilities, allow us to work together, and in many ways be a reflection of our every day lives. In late November, 2015 we launched the website for Full of Days. Full of Days currently serves as a creative outlet for us: writing, design, apparel, growing a blog and provides a canvas for us to audition ideas that we can then apply to other Smalltown Design clients. How does the saying go? Find a way to earn a living doing what you love and you will never work a day in your life...We love this project! To visit Full of Days click on any of the images below. Over the last few months, Smalltown Design has been working with Jonnie Bradley and The Wise Guide to develop their new website. The Wise Guide is an established print publication, serving as a Health and Wellness Resource for North Idaho. If you have picked up a previous edition of The Wise Gide then you have seen an informative and well designed magazine. Smalltown Design's challenge was to design a website that matched the quality, and maintained the warm and welcoming feel, of the print version. While also incorporating a more modern feel for internet visitors and offering social media options. We are ecstatic with the results! 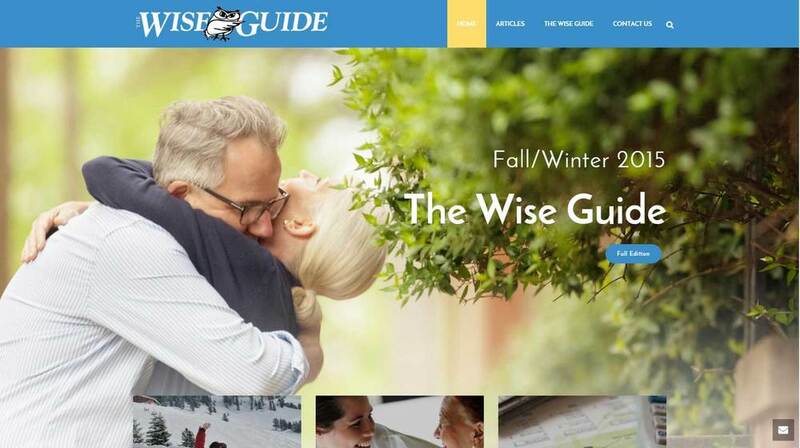 The Wise Guide is a vast resource for anyone with questions about getting older. With articles on Physical, Financial and Mental Health, answers to questions on Insurance, Independent or Assisted living, and plenty of guidance on how to make decisions about the later stages of life, The Wise Guide is great free resource! Visit their new website and watch for weekly content updates. New Business Cards for the Bonners Ferry Chamber of Commerce. Always great working with Jaycee and Patti on creating a design that reflects the county! After 20 years of design ideas, prototypes and trials, Travis Smith and Smith Industries, Inc. brings to market the Auto-Hatchet Pro - an automated kindling machine (they only one designed and manufactured in the USA). Affordable, compact, quite, reliable and easy to set up and operate, the Auto-Hatchet Pro is a great solution for anyone looking for part time income, a home business, or an additional revenue stream for an existing business. Smalltown Design partnered with Smith Industries to create business cards, rack cards and a website for this great product. It's banquet time! This month is the annual Boundary County Ducks Unlimited Banquet & Fundraiser. Smalltown Design was privileged to produce a 10' x 3' exterior banner, with hemmed edges and grommets, for the event. Thank you, Susan! Pick up your tickets at Mountain West Bank or purchase them online! New logo for Aspire - The Women's Ministry at Mountain Springs Church. The Junior Class Parents (Bonners Ferry High School) wants you to have "The Best Seat in the House"! In an effort to raise funds for the Junior Class, parents will have a couch at the football games this season and raffle off tickets for "The Best Seat in the House". At each game a winner will be selected and gets to pick 2 other people to sit with them on the couch, in the middle of the stands, get a free dinner/drinks and 2 high school attendants to run and get them whatever they want. For this fundraiser a brand new couch was donated by Becks Furniture and Smalltown Design created a banner for promotion. Get comfy and enjoy the game! Coming soon to BFHS volleyball and basketball games! The parents smartly ordered the banner minus the "Class of 2016" - this will allow future Junior Classes to use the same banner in the years to come. Aspire, the Women's Ministry @ Mountain Spring Church, has a monthly event "Revive". They are smartly using "business cards" as a cost efficient way to communicate the event details.